As the Cleveland Indians play in the 2016 World Series against the Chicago Cubs, here’s a Lorain connection, courtesy of local historian Jim Smith: “The last time the Cubs made it to the World Series was in 1945. The Cubs’ General Manager was Jim Gallagher. 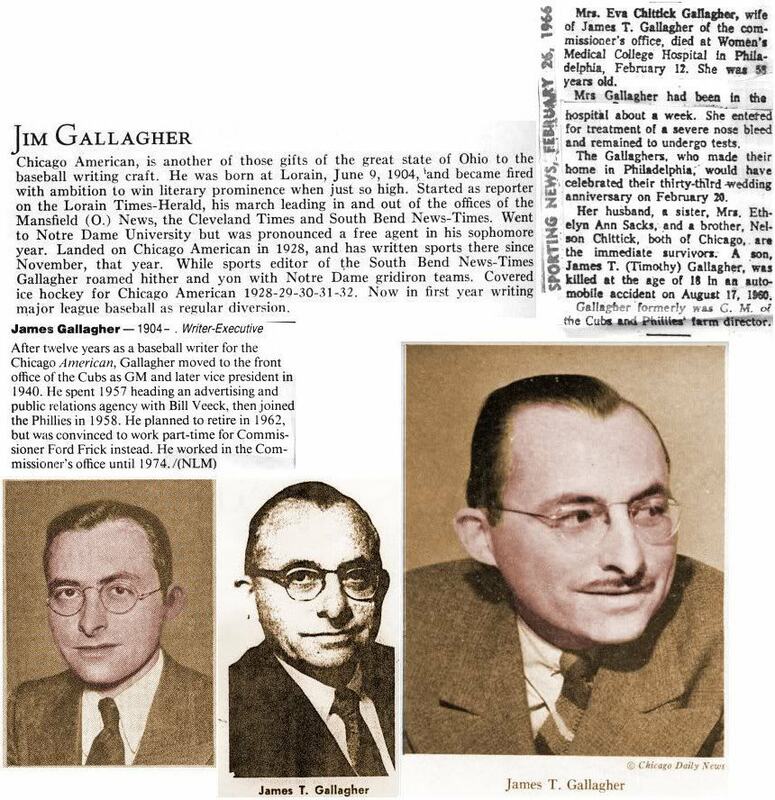 Jim was born in 1904 at Lorain, Ohio.” More on Gallagher is in the accompanying image. Gallagher was appointed Cubs’ GM on Nov. 14, 1940. 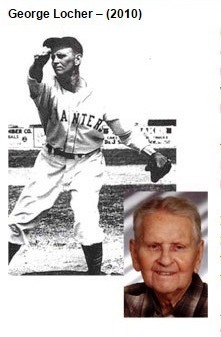 George Locher was a talented sandlot baseball pitcher and position player, and his skills eventually propelled him into a professional baseball career in the years following WWII. Locher, 92, died Oct. 18, 2016, at his home in Lorain. He was enshrined in the Lorain Sports Hall of Fame in 2010. His obituary can be seen at this link. We offer our condolences to his family. 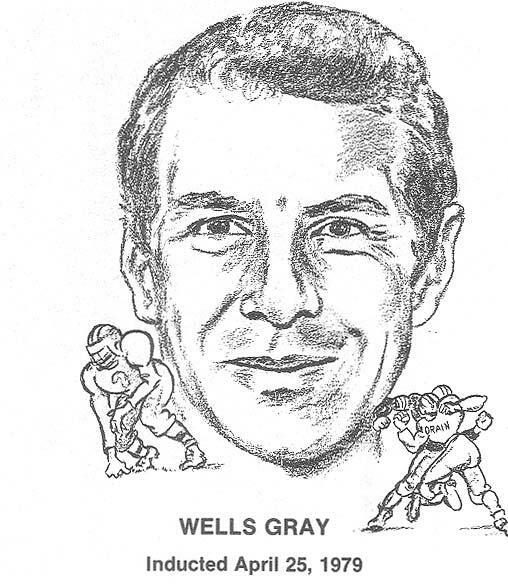 Wells Gray, 82, who was inducted into the Lorain Sports Hall of Fame in 1979, passed away Oct. 15. The 1952A Lorain High graduate was an outstanding offensive lineman with the Steelmen. In college at the University of Wisconsin, he was a member of the Badgers’ 1953 Rose Bowl team and, in 1955, he was named team captain. His obituary can be seen at this link. Our condolences to his family. Congratulations, Titans! 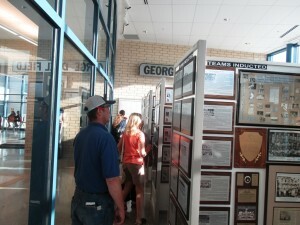 The Lorain Sports Hall of Fame is honored to have its museum in the new Lorain High School! Public tours of the school and the LSHOF museum continue today, Sept. 17, from 3-7 p.m. Starting on Sept. 20, the museum will be open to the public, free, Tuesdays through Thursdays from 11 a.m. to 3 p.m. The museum entrance is next to the entrance for the Lorain High School Athletics Center near the parking lot off Pole Avenue. The museum has nearly 400 plaques telling about hall of fame athletes and teams from Lorain’s various high schools over the years, plus trophies, historical photos and sports memorabilia. 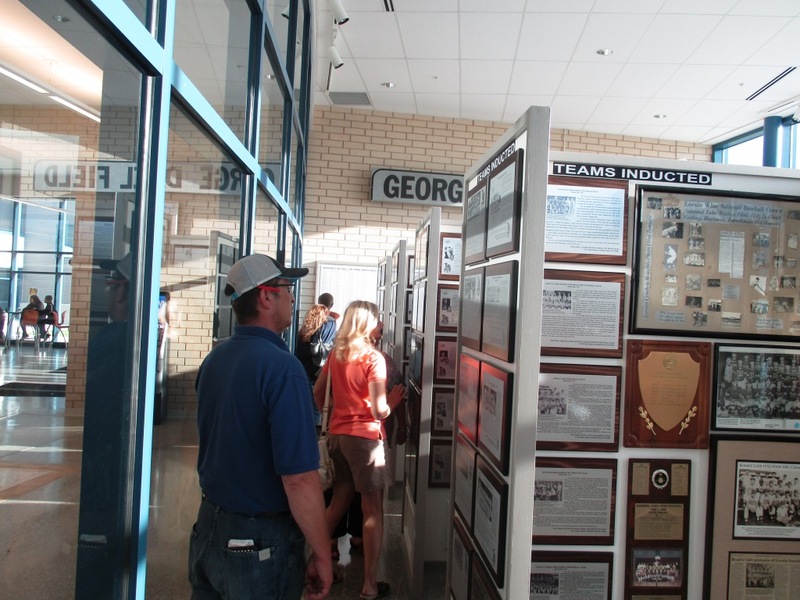 Visitors began to tour the new Lorain Sports Hall of Fame Museum Thursday, Sept. 15, during the three-day Lorain High School Open House and Ribbon-Cutting Ceremonies, with tours of the school and museum. 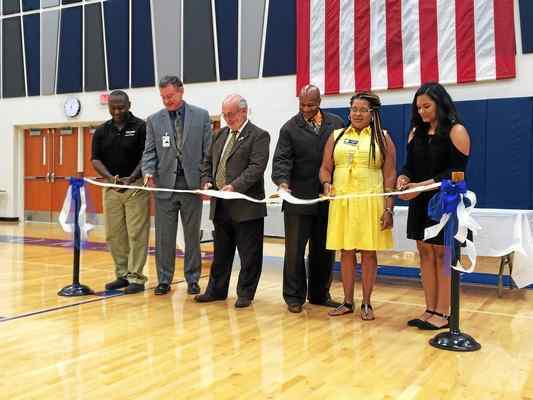 This marked the opening of the new museum at Lorain High. The museum was formerly located in the now-closed St. Joseph Community Center. The Lorain Schools graciously made the new museum space available to the Hall of Fame Committee. It’s the best spot in town for educating and inspiring new generations about Lorain’s top athletes and their achievements. The museum will also be open Friday, Sept. 16 from 4 p.m. to 7 p.m. and Saturday, Sept. 17 from 3 p.m. to 7 p.m. during Lorain High’s opening celebrations. More information about the school’s opening events is available at this link. 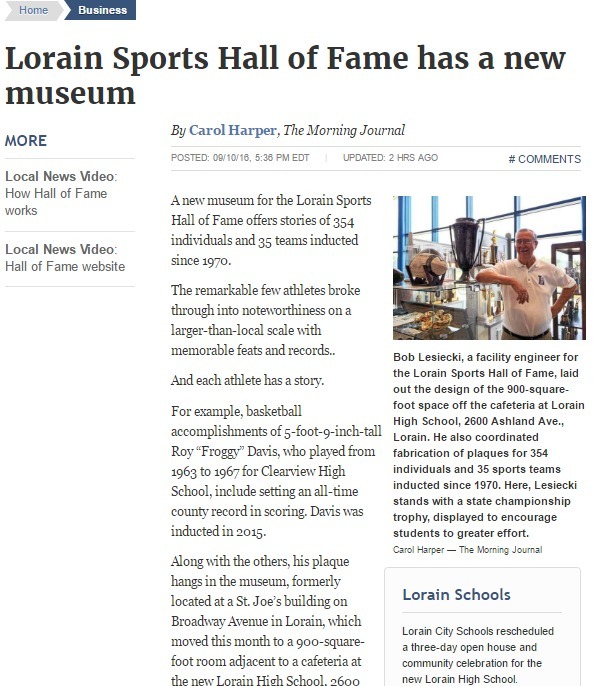 Starting Sept. 20, the Lorain Sports Hall of Fame Museum will be open Tuesdays, Wednesdays and Thursdays from 11 a.m. to 3 p.m. Also, watch on our website or Facebook page for announcements of occasional evening museum hours during special sporting events at Lorain High. Check out the nice Morning Journal story and video about our new LSHOF museum today. Just click this link to see it. The Lorain Sports Hall of Fame congratulates Lorain High School volleyball head coach Lynne Rositano on her 100th career coaching win! More news on the milestone victory is at this link. 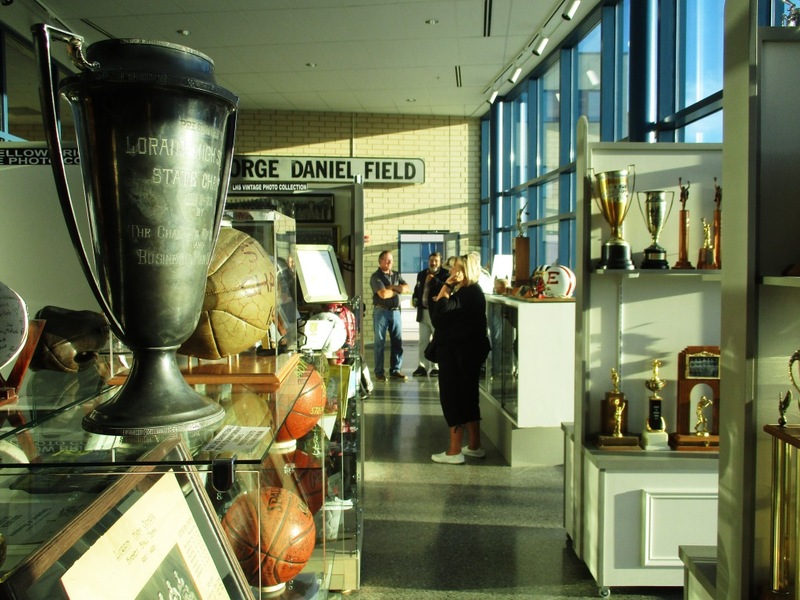 The new Lorain Sports Hall of Fame Museum will be open afternoons and evenings throughout the rescheduled Sept. 15-17 Lorain High School Open House & Ribbon Cutting celebrations. Take a tour of the high school and visit the LSHOF Museum, too. The museum is located off the cafeteria, next to the entrance of the Lorain High Athletics Center. Starting Sept. 20, regular museum hours will be Tuesdays, Wednesdays and Thursdays from 11 a.m. to 3 p.m. Admission is free. Click on this link for more on the Sept. 15-17 high school open house. Also, the museum will be open throughout the rescheduled three-day Lorain High School Open House and Ribbon Cutting celebrations. Details to be announced. Former Southview High School state champion wrestler Billy Kopp recently spotted a police “Fugitive of the Week” and alerted an officer he knew, who quickly took the suspect into custody in connection with an attack on two women in Lorain. Outstanding work by Billy Kopp, who was inducted into the Lorain Sports Hall of Fame in 2015. Now’s the time to act if you’d like to nominate a Lorain athlete for induction into the Lorain Sports Hall of Fame. Nominations for the 2017 class of inductees close on Sept. 30, 2016. Full details on who’s eligible and what information is required are on the nomination form, which can be downloaded by clicking on this link.